the heart of Split. The location is perfect - at the center of it all. Other features included a small touches that makes a huge difference - use of a laptop with unlimited high speed internet access with the WiFi, air conditioning room, kitchenette with utensils, electrical kettle, satelite LCD TV, well-stocked bathroom with hair dryer, design linen, four pillows, extra blankets, local artwork, etc. Located within the old city (in the walls of Diocletian's Palace) and right on the money, this place is just the perfect base for exploring Split. There are nice local bars nearby for enjoying your evenings. 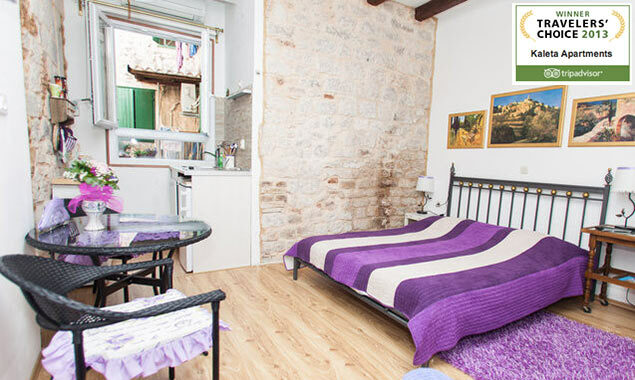 The apartment wasa lovely mix of rustic (bare stone walls, ceiling beams) and modern (kitchenette with electric hob and brand new shower room). There was a kettle and tea and coffee supplied to save you the trip to the shops. Other features included flat screen TV connected to cable, a hairdryer, and air conditioning. Some reviewers have commented on the convenience of having a computer with free internet access, and we also found this very useful. It was well kept and immaculately clean. We had a little trouble with getting from the airport to the old city. No-one, inclusing tourist information was willing to tell us that the bus stop is OUTSIDE the airport and across the road from it, and we got the wrong bus (don't get bus 37 or you end up outside the old city). As a result, Negri's son ended up waiting over 45 minutes for us. Without a word of complaint he shown us to the apartment and offered us all the help we needed. They even stored our luggage for us after we checked out and before we took the ferry to Rijeka. All in all a great place to stay, good value and tremendously helpful service. Oh, and the Pizzeria in the Golden Gate Palace round the corner (Majstora Jurja 11) is very nice too! "GORGEOUS APARTEMENTS FOR AMAZING PRICE"
Lovely apartment, lots of room, very smart, with laptop and satelite tv, wonderfully decorated, exceptionally clean, very good price, would come back again and again. "GREAT APARTMENT, WELL LOCATED AND WOULD STAY AGAIN!" We were pleasantly surprised with this apartment. We arrived by bus from Dubrovnik, phoned Negri on our arrival and was met by her son and friend at the entrance to the Diocletian Place, which was only a 5 min walk. They expertly took us though the lane ways within the Palace walls to our apartment. There is a small common area at the entrance to the apartments which has a laptop computer available for use on the internet for those who don't carry there own. The apartment we had was large and roomy. A lovely king size bed, couch, small table with chairs, kitchenette with all your cooking needs and a lovely bathroom. It had been recently re-decorated. Being located in the Diocletian Palace it was close to everything. A little noisy at night but with the windows closed and the airconditioning on, it wasn't too bad. We left Split by ferry to Ancona and the port was only a 10 min walk from the apartment which was very handy. It was exceptional value for the money. Would definitely recommend and would stay there again. Kaleta Apartments is my choice when staying in Split. The owner was very accommodating considering our check-in at 9am and nothing was too much trouble. Rooms come complete with a small flat screen TV, A/C (needed during thisamazing summer weather), hair dryer and fridge. A great place to stay when in Split! "EXCELLENT STAY - VALUE MONEY...."
"ABOVE AND BEYONDE A 5 STAR RATING!!!" We couldn't have been happier with our experience at Kaleta Apartments. The apartment was beatuiful, elegant and modern, yet had an old world charm that fit perfectly into the surroundings. My girlfriend and I were stunned bythe friendy hospitaly the owners offered us. It was located in the heart of the city Split, and the owner was so kind to show us his new apartments which are a two minute walk from the apartment we were staying at . 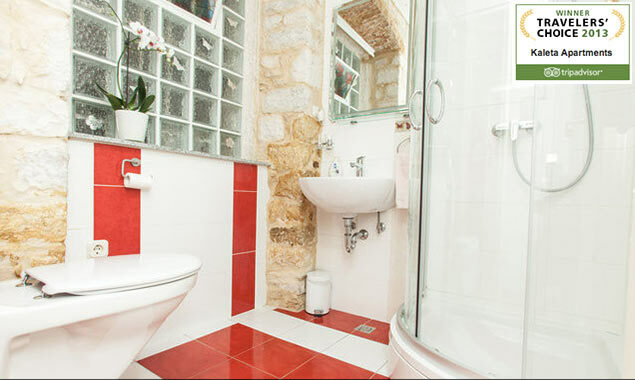 My girl friend and I have traveled to many palaces around the world such as Morocoo, Venice, Barcelona, etc... and Kaleta Apartments has the best rooms at an affordable price. There apartment is above and beyond a 5 star rating.Getting the apartments at the prices the owner offers is a complete bargain and it can not be beat even by the most luxurious hotels in Split. "ABSOLUTE BARGING IN FAB LOCATION"
If you want to a more authentic stay in Split, this is the place for you. Amazing location (you can walk everywhere) and great value for money (we paid about £50/night for a spacious room). We loved Split, and the highlights were drinking lots of great coffee in the many cafes in Old Town, and a day trip to the island of Solta for a tour and lunch at Olynthia olive oil. "BAR ATMOSPHERE IN ROOM, BUT ONLY ON DEMAND WHEN WINDOWS OPEN :)"
"LIVES UP TO THE RATING"
Wonderful studio apartment great location and quiet. We had a laptop however there is a PC in the room with fast internet connection. 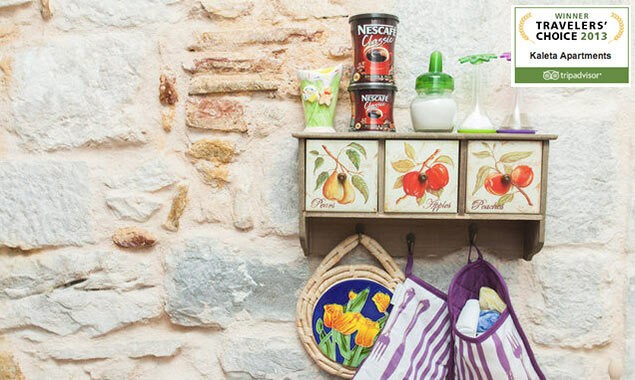 What you see is what you get and more, little extras like coffee and the necessary to startyou off. Could not find a fault at all, we were met promptly and could not believe how friendly and trusting the lady was, I hope to get back again when the weather is warmer found it to be much nicer in Split than Dubrovnik. 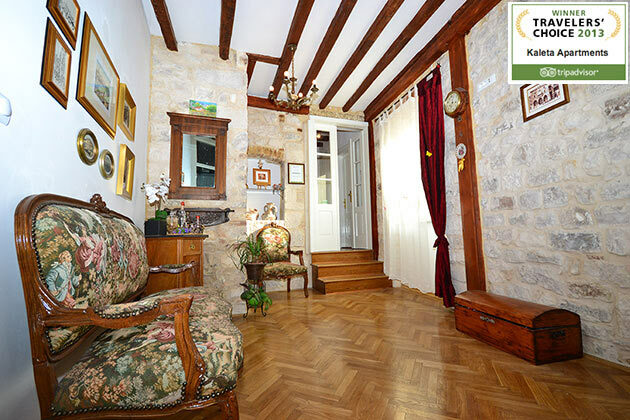 A cozy apartment in the heart of Diocletian's Palace. After checking in you are left on your own to live like a local which we had great fun doing for four days. 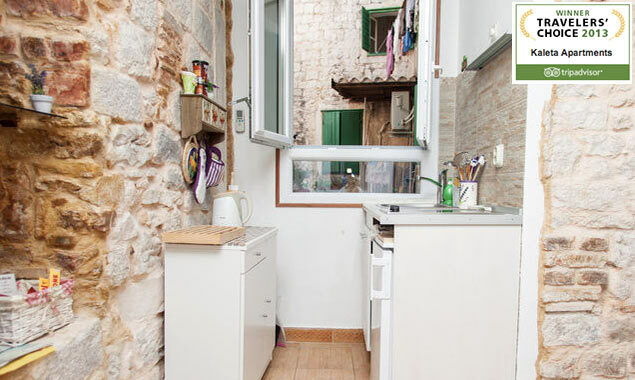 As mentioned in previous reviews, the apartments are above smoky, noisy bars/cafes, but this can be managed by closing the shutters and windows and turning on the quiet A/C. We had Apt B which seemed to be the better of the two for location. A bakery, takeout pizza, small grocery store are all close by. We highly recommend staying in the Old Town and being close to the Riva waterfront and all the charms of the Palace. Overall, the Kaleta gave great value. We stayed in a great studio apartment in the perfect location. The apartment was really cute and clean, the bed was comfortable, the kitchen had everything we needed for our three day stay, and the bathroom was great. It is right upstairs from a cafe, and when the windows are closed, the noise is not a problem. We liked the buzz from the cafe; it added something to the ambiance of the place. There is an air conditioner, a flat screen tv, and a pc. It is inside the palace walls and really close to the green market, which you should go to, for sure. We wished we could have stayed forever. Damn you, reality.